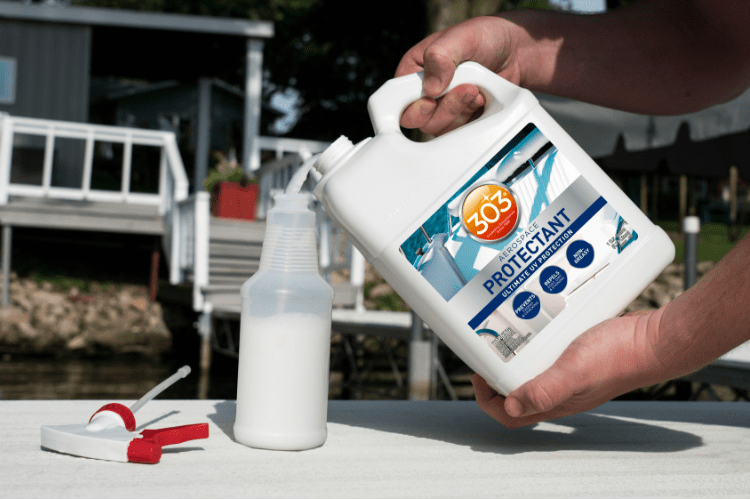 No other product provides this much protection for your boat and water gear. Use Aerospace Protectant to keep your boat’s seats, sails, hull and windows colorful and clean. Marine Aerospace Protectant is a premium protectant designed to safeguard boats and boat equipment against the damaging effects of daily exposure to UV rays. It’s safe for use on outdoor gear and apparel, too. Simply spray on and wipe dry to restore color and luster, repel stains and prevent fading even in the harshest marine conditions and sunniest climates. Aerospace Marine will even help keep fishing gear clean and prevent inflatable boats from sticking together during storage. And because it’s 100% free of grease-producing silicone oils and petroleum distillates, Aerospace is safe to use on all your outdoor materials—vinyl, rubber, fiberglass and more. No other protectant beautifies as intensely or preserves as powerfully. Keep your boat, water sport equipment and outdoor gear shiny season after season. Use only on clean surfaces. For best results use 303® Multi-Surface Cleaner. Place a drop cloth under the cleaner to be treated to catch any over spray. 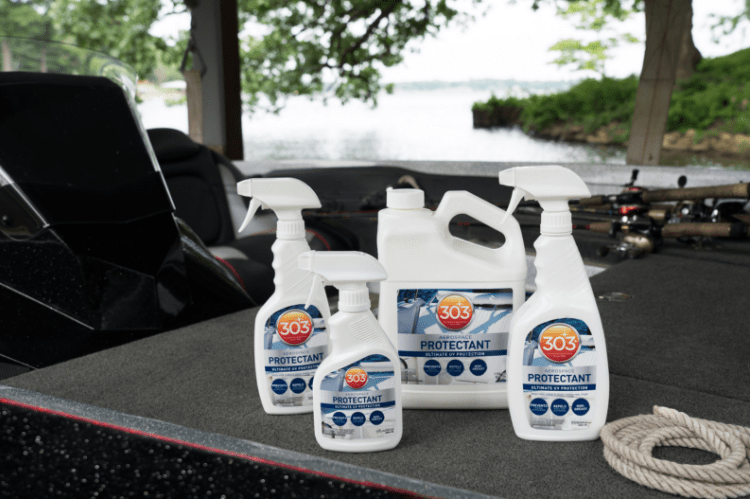 Out of direct sun, spray surface with 303® Aerospace Protectant and WIPE COMPLETELY DRY. If streaking occurs, too much product has been used. Use a wet towel to remove excess, IMMEDIATELY WIPE COMPLETELY DRY. Note: this product does not air dry. Extra buffing with a dry cloth INCREASES bonding, repellency & longevity. Apply every 3-5 weeks for maximum UV protection. Great for use on a variety of surfaces such as: vinyl, leather, plastics, synthetic & natural rubber, eisenglass, PVC, gel coat & fiberglass. Ideal for: Hypalon inflatable boats, wet/dry suits, tires, side-out seals, RV EDPM rubber roofing (for your safety, never walk on a wet roof), helmets, visors, and goggles. Not for use on unfinished leathers (such as suede), fabrics (canvas) or floorings. Boat Bimini Tops: Protect your boat cover all year from the sun’s harmful UV rays (which can cause fading/cracking) in the summer months, and in the winter, it will keep the material pliable and prevent it from drying out and cracking. 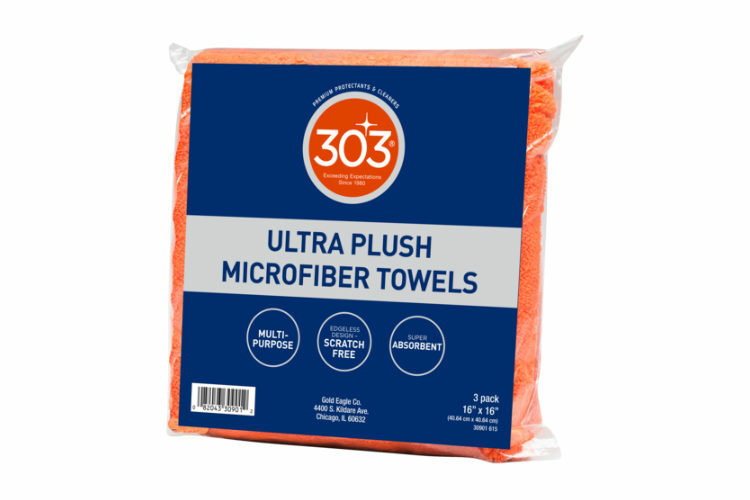 303 Aerospace Protectant will also help make snow and ice accumulation easier to remove/brush off as well. Boat Fenders: Use on your boat fenders to protect from the sun’s harmful UV rays (which can cause fading/cracking) in the summer months. Does 303 Aerospace Protectant contain silicone? 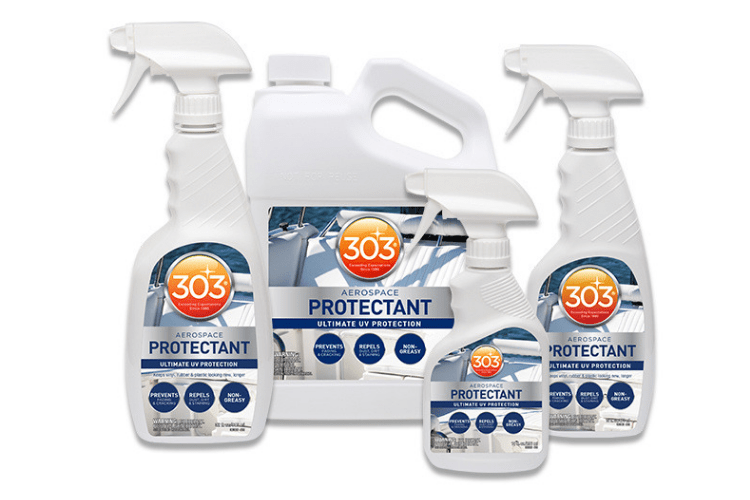 303 Protectant does not contain any harmful silicone oils, which can dry out and damage surfaces. 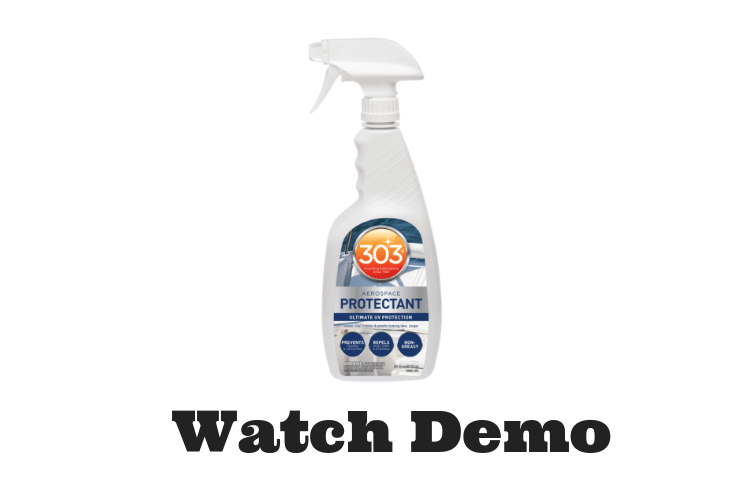 How does 303 Aerospace Protectant work? Originally engineered for aerospace and aviation applications, 303® Aerospace Protectant™ is a premium surface treatment that instantly beautifies and provides superior protection against harmful UV rays that can cause loss of mechanical properties such as: discoloration, fading, embrittlement, cracking and/or chalking. Treated surfaces repel dirt, soiling, staining, water spots, salt water and mildew. What is 303 Aerospace Protectant? 303 Protectant is a water-based proprietary formula that contains no petroleum distillates, alcohol, mineral oil or harmful silicone oils. 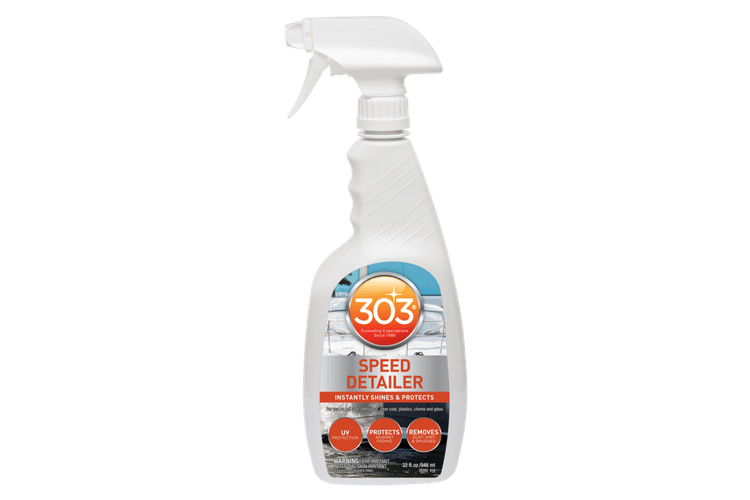 What is the difference between 303® Aerospace Protectant and 303® Speed Detailer™? Each formula is unique and specially formulated for specific applications. 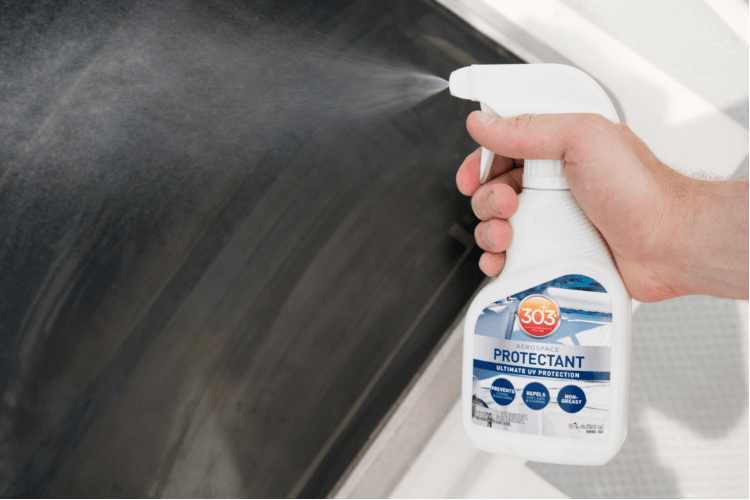 What surfaces can 303 Aerospace Protectant be used on? 303® Aerospace Protectant™ is great for use on a variety of surfaces including vinyl, plastics, synthetic and natural rubber, PVC, finished leather, teak, colored gel-coat fiberglass, clear vinyl (Eisenglass) windows, and more! DO NOT use on unfinished leathers (such as suede), fabrics or floorings. 303® Marine Aerospace Protectant is rated 4.8 out of 5 by 25. Rated 5 out of 5 by 2vette2camaro from Can't live without this product!!! This product is AMAZING to say the least. Since trying the product, I will NEVER buy another protectant other than 303 Aerospace Protectant. It is easy to use, protects against UV rays and makes everything it is used on look awesome! I use it on dashes, vinyl tops, door panels and all other interior. I also use it on hoses, the leather seats on my Harleys and anything that needs a nice luster with the added protection of this product. Rated 5 out of 5 by Dale from Awesome product I first used the 303 marine protective cleaner followed with the 303 aerospace protectant. It cleaned off a year of dirt and mildew. I was amazed that the seat looked new again. I was afraid it would leave an oily feel but it didn't. Supper happy. I am 100% sold on 303. Thank you soooo much!!!! Rated 5 out of 5 by racerrandy from Works Great! I use 303 Marine & Recreation Aerospace Protectant on a fiberglass bed cover for my 2015 Chevy Silverado pickup. The bed cover is black, and is subjected to constant sun and heat here in Arizona. 303 Aerospace Protectant keeps the black fiberglass looking great and the rubber gaskets & trim flexible and looking new. 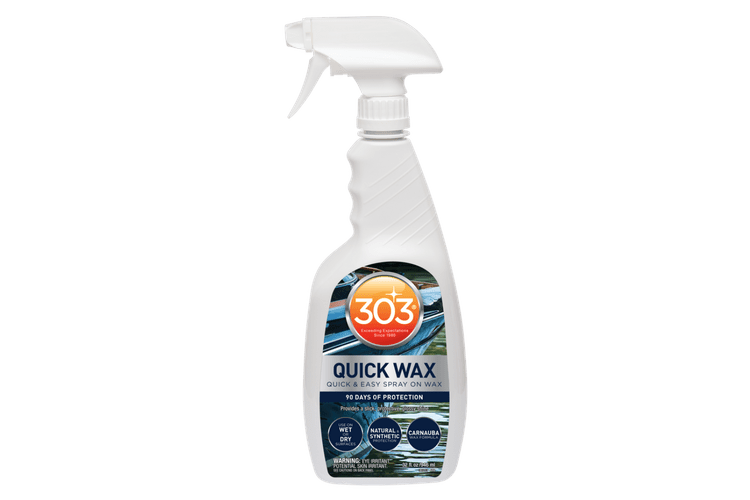 303 Aerospace Protectant takes a few more minutes to use, as you have to wipe the surface completely dry, but the results are worth it! Rated 5 out of 5 by TheBigOldDog from Nothing works better or lasts longer than 303 Aero When I purchased a boat and became active in boating everybody and I am everybody recommended using 303 Aerospace Protestant to protect and beautify the Marine vinyl used on seats, preservers and numerous other things. Nothing holds up to the salt and sun like 303. Once applied it keeps it from fading and makes it easier to clean and repeals stains. Unlike other products, it also lasts. I then realized if it worked that good in the harsh conditions of the ocean, it would work really well on my truck! So, now I use it on my tourneau cover and dashboard and it looks great and last a really long time even after repeated car washes. The black tourneau still looks brand new and I only have to reapply like 2-3 times a year. despite the sun beating down on the horizontal surface, the road salt used during our Northeast winters and the salty air of our coastal area. Rated 5 out of 5 by Stingray from 303 Works great on your vehicle's plastic trim I used the 303 on my Trailblazer's plastic trim pieces. Over time they were getting sun faded and that chalky residue from sun damage. After applying the 303, it had restored the original color and repaired the chalky layer from sun damage. I am pretty impressed with the results. Another fine product I've used from Gold Eagle! Use this product to protect any exterior surface as directed and expect great results. Rated 5 out of 5 by Sharpie from BEST PRODUCT EVER! I received a free sample while attending a 5k charity event in Saint Petersburg FL. When our hottub cover began to crack & dry rot due to the intense FL heat I was worried I'd have to buy a new one. I tried 303 and was amazed at the results. Not only did 303 make the cover shiny and nice, it protected it from further damage & seemed to repair the dry rot! A FANTASTIC PRODUCT! KEEP UP THE GREAT WORK GOLD EAGLE!!! Rated 5 out of 5 by GiGi from Works Great I used this product on my pontoon boat seats after washing them and it really works well. It makes them shine slightly but does not feel oily or greasy like other products. Nor does it seem to transfer to clothes when sitting on seats. 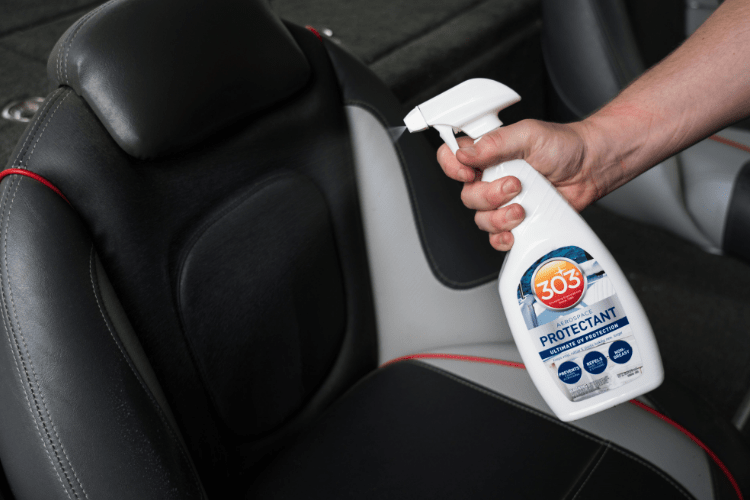 Most importantly, it provides a layer of protection that keeps the seats from getting dirty or mildewed.